PLEASE READ THE DESCRIPTION CAREFULLY! 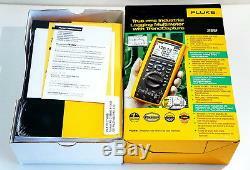 FLUKE 289 TRUE-RMS INDUSTRIAL DATA LOGGING DIGITAL MULTIMETER WITH TRENDCAPTURE. 0.025% basic DC accuracy. True RMS AC + DC measurements. 100 kHz AC bandwidth for voltage and current. Dual display with bargraph and two-level backlight. Min/max/average with real time clock and 250 µs Fast Min-Max. Frequency, capacitance, duty cycle & pulse width measurements. Resistance, conductance, continuity and diode measurements. Temperature and dBV/dBm with selectable reference. 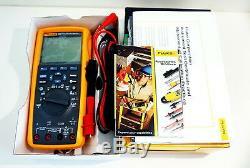 Battery and fuse access without breaking calibration seal. EN 61010-1 (IEC 1010-1) CAT III 1000V /CAT IV 600V. Internal memory allows stand-alone logging of up to 1000 measurements (189 only). Readings memory for up to 100 readings (189 only). All inputs are protected to EN61010-1 CAT IV 600V/CAT III 1000V. CSA, TÜV listed and VDE Pending. Accuracies are best accuracies for each function. 20 °C to +55 °C. 40 °C to +60 °C. 0% to 90% (0 °C - 35 °C). 0% to 70% (35 °C - 55 °C). EN 61010-1 to 1000 V CAT III. EN 61010-1 to 600 V CAT IV. CSA, UL, TÜV, VDE Pending. 203 x 100 x 50 mm. 72 hours typical, without backlight. 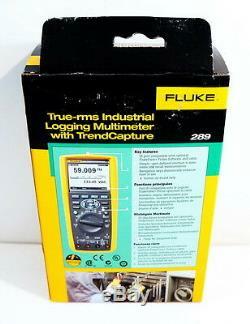 289 True-RMS Industrial Logging Multimeter. We are extremely busy, so we might not answer your emails. Items will be replaced or exchanged in case of DOA. All packages will go out after the weekend or after the holidays. 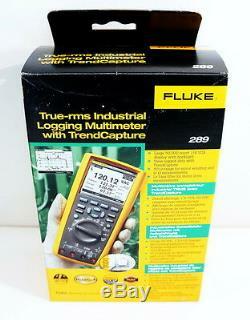 The item "FLUKE 289 TRUE RMS INDUSTRIAL DATA LOGGING DIGITAL W TRENDCAPTURE MULTIMETER NEW" is in sale since Friday, February 7, 2014. 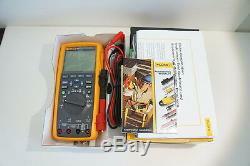 This item is in the category "Business & Industrial\Test, Measurement & Inspection\Test Meters & Detectors\Multimeters". The seller is "computer_psycho" and is located in Van Nuys, California.